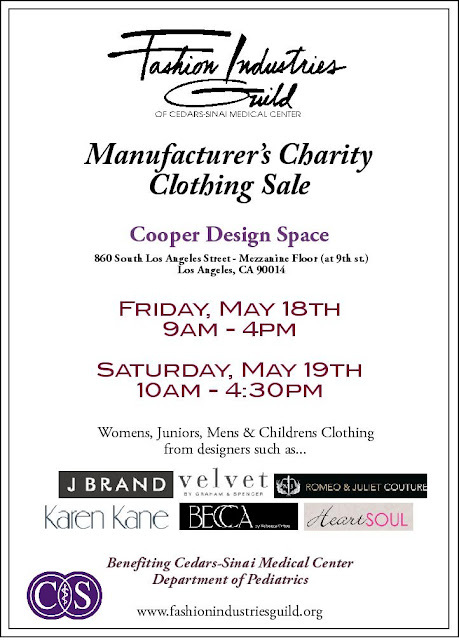 Fashion Industries Guild Charity Clothing Sale is on May 18 and 19 at the Cooper Design Space Participating designers include JBrand, Velvet, Romeo & Juliet Couture, Becca Swimwear, Karen Kane and many more. All proceeds from the sale will be donated to the Pediatric Department at Cedars-Sinai Medical Center. You can't go wrong with shopping for a good cause! The Rebecca Minkoff Sample Sale is on May 18-20 at Confederacy. Friday and Saturday from 11am-7pm, Sun from noon-6pm. Save 30%-70% on samples and overproduction apparel, shoes, handbags and small leather goods. 4661 Hollywood Blvd., Los Angeles 90027. The BCBG Max Azria Warehouse Sale is on May 19-20 from 8am-1pm. Save 70%-85% on women’s apparel. 2761 Fruitland Ave., Vernon 90058. Bring school supplies and get an additional 10% off as part of the proceeds go to a children's charity. Lv3hreeshaowen louis vuitton outlet store belongs to the a good number of Louis Vuitton companies in wash rag pieces with the Louis Vuitton 2012 in France's. On Paris on 1854 approved his particular louis vuitton bags the best trolley suitcase louis vuitton handbags. A hundred years soon after, Louis Vuitton Outlet essentials and even wash rag pieces in becoming the most impressive patches of that product, and even turned out to be emblematic in increased contemporary culture. At present, that louis vuitton product has not primarily restricted to the design and style and even deal in high-end wash rag pieces and even essentials, though in becoming related to designer, accents, boots, plastic bags, expensive jewelry, running watches, storage devices, red wine besides other farms belonging to the icon style indicators.Louis Vuitton Outlet Lockit a complete in basic steps units, this includes: Lockit Monogram, louis vuitton handbags outlet, Lockit Epi, Lockit Nomade, Lockit MM, Lockit GM, Lockit PM HOURS. First of all, wireless home security cameras are cheap. don't require any type of energy.